The Splattered Platter is a paint it yourself pottery studio located inside the Towne Mall in Middletown, Ohio. They make over 85% of their pieces right in their studio! They would love to show how it's done so just ask for a tour while you’re there! They have over 500 pieces to choose from in the studio. They try to carry as many pieces as they can so that the possibilities are endless! 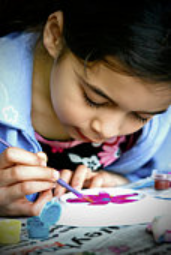 They offer parties for pottery, canvas, mosaics or wine glass painting. Minimum 6 adults: $75 + the pieces you choose to paint. Add $5.00 each additional painter over 6 + the price of the pieces you choose. You are encourage to schedule your party at least 2 weeks in advance. WEDNESDAY IS BOGO STUDIO FEE - BUY ONE STUDIO FEE AT REGULAR PRICE AND GET HALF OFF THE SECOND PAINTER'S STUDIO FEE THE SAME DAY! FRIDAY IS POTTERY AND PIZZA - PIZZA IS ON THE HOUSE FROM 6-8 PM EVERY FRIDAY EVENING. YOU BRING YOUR DRINKS OR PURCHASE BOTTLED WATER AT THE STUDIO.